As many of you may have heard, earlier this week I issued a statement regarding the U.S. government’s treatment of people seeking to enter this country at the U.S.-Mexican border. Obviously, the reports of all that is happening at the border, particularly separating small children from their parents, and the very dismissive way that asylum cases are being handled is both disturbing and worrisome. I issued this statement because I felt so strongly that what is happening is unacceptable and that we need to protest the way that these families are being treated. Immigration policy presents many challenges for any country. Developing sound immigration policy that respects the needs of a nation and those of the international community is a complex and challenging process. It always involves reconciling domestic priorities and global demands, strategy and tactics, objectives and means. At its core, immigration policy is about people, young and old, alone or in families, often fearful and abandoned. Immigration policy is a moral question that cannot be separated from decisions of what is right and wrong, of justice and injustice. It is about respecting and reverencing the dignity of the human person. In the year 2018, the moral challenge of immigration is mounting for the United States. On too many occasions our government has taken a posture and established policy which is in principle and in practice hostile to children and families who are fleeing violence, gangs, and poverty. The policies have included limiting the number of refugees and immigrants we are willing to welcome in our country, ending Temporary Protected Status for families who are here, and refusing to restore DACA protection for those who have been among us for all or most of their lives. In the face of today’s global immigration crisis these choices fail to communicate a willingness to address the reality of widespread human suffering, and in many cases imminent danger, with compassion and care. As a Catholic bishop, I support political and legal authority. I have always taught respect for the civil law and will continue to do so. But, I cannot be silent when our country’s immigration policy destroys families, traumatizes parents, and terrorizes children. The harmful and unjust policy of separating children from their parents must be ended. On Thursday, I had a chance to meet with my good friend, Francis Suarez, the Mayor of Miami, who was in town for the annual meeting of the U.S. Conference of Mayors, which was held in Boston last weekend. Francis came to visit me at the cathedral along with his police chief and his Sergeants at Arms who were with him for the conference. The Suarez family was very much involved in my ministry at the Centro Católico in Washington. I celebrated the wedding of his parents, baptized him and celebrated his marriage to his wife, Gloria. So, I have known Francis all his life. It is a wonderful thing to see him now as a young professional really making a very positive contribution to the life of the city of Miami, just as his father Xavier did. Later that day, I had a chance to see the progress of the ongoing work at the cathedral. We looked at different colors and they showed us how the Stations of the Cross are being restored. It was just very impressive to see all that is being done. 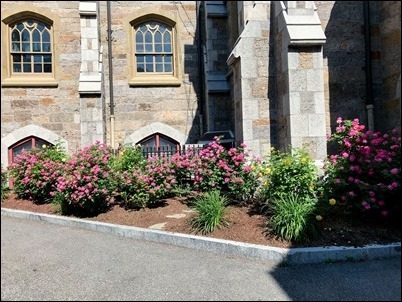 Friday, I went to the dedication of a new garden at the New England Historic Genealogical Society in honor of Carolyn Lynch, who was very involved in the society and was a member of their Board of Directors. 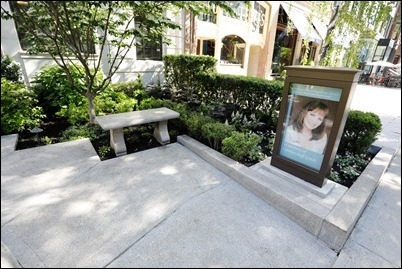 The garden is right in front of the society’s Newbury Street building. 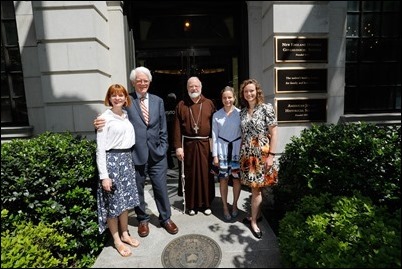 With us for the dedication were, of course, Peter Lynch and his three daughters Mary, Annie and Elizabeth, along with members of the Catholic Schools Foundation and the Board of Directors of the Genealogical Society. 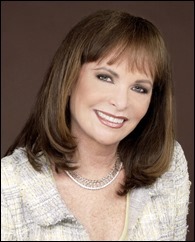 I was very happy to be at the event to honor the memory of Carolyn Lynch. We are also very pleased the society has partnered with the archdiocese to digitize our historic sacramental records going back to the very beginning of Archdiocese of Boston. 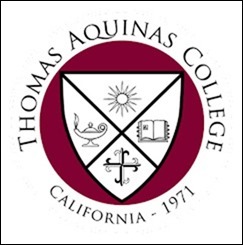 Also that day I met with Michael MacLean, the president of Thomas Aquinas College in California. 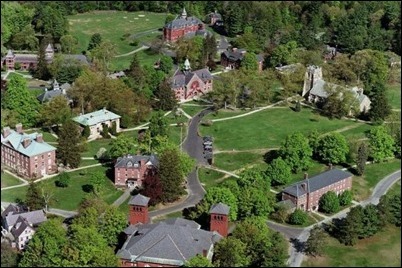 They have received some property in Northfield, in Western Massachusetts, and are planning to establish a satellite campus here. It is a Great Books-format school with a very strong emphasis on Catholic formation. So, we’re very pleased that they are coming to Massachusetts. 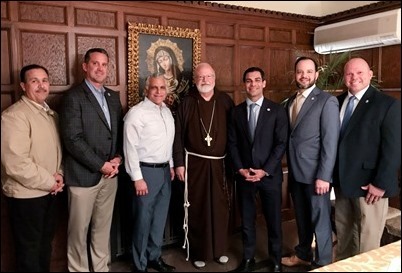 We also know that it will mean a lot to the people of the Springfield area, as well as the whole state, that a new Catholic college is coming to Massachusetts. 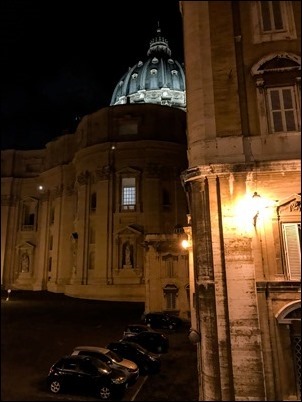 On Saturday, I departed for Rome for the meeting of the C9 Council of Cardinals advising the Holy Father on the reform of the Roman Curia. 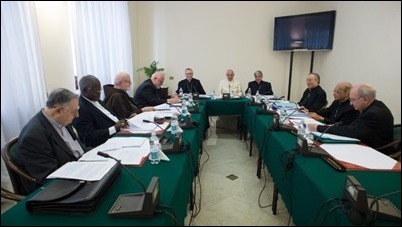 We had our regular meetings of the Holy Father and we received reports from Msgr. Brian Ferme on the Secretariat for the Economy. One of our major actions during this gathering was to present the Holy Father with a first draft of the document Predicate Evangelium, which is to replace Pastor Bonus, the document describing the structure of the Roman Curia. 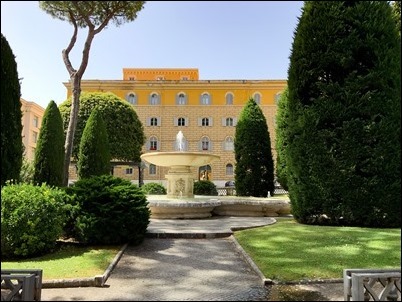 As I always do whenever I am in Rome, I visited with the staff of the Pontifical Commission for the Protection of Minors and we had a Mass together. 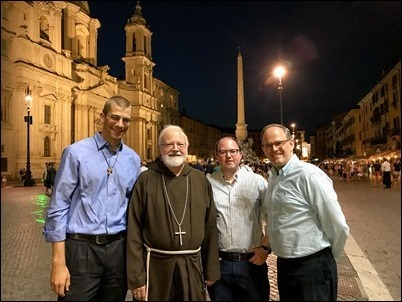 One night we went to the Piazza Navona for a dinner with a number of Boston priests and seminarians who were in Rome. We were also joined by Sister Jeanne Gribaudo of Merrimack college who was on a Jubilee trip to Rome as well as Mr. Bob Morrissey, who was in Rome in his capacity as financial advisor to the Jesuit Order. It was wonderful to be able to see them in Rome!